At least by volume, there are more walnuts in this recipe than anything else except sugar. 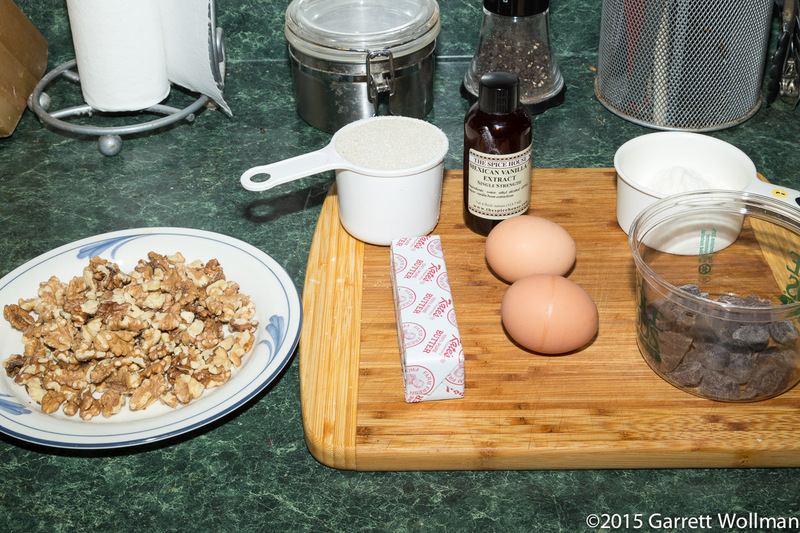 (I toasted the walnuts, because it’s what you do, even though the recipe did not call for it.) There’s only a quarter-cup of flour, and rather surprisingly, absolutely no leavening at all; the only chocolate flavor is provided by a meager two ounces of unsweetened chocolate. (This last is perhaps not surprising for a recipe that dates to the early 1980s, before many Americans learned what chocolate actually tastes like.) The fat in this recipe, aside from the cocoa butter, is all butter-butter, not vegetable oil as with many commercial brownies. 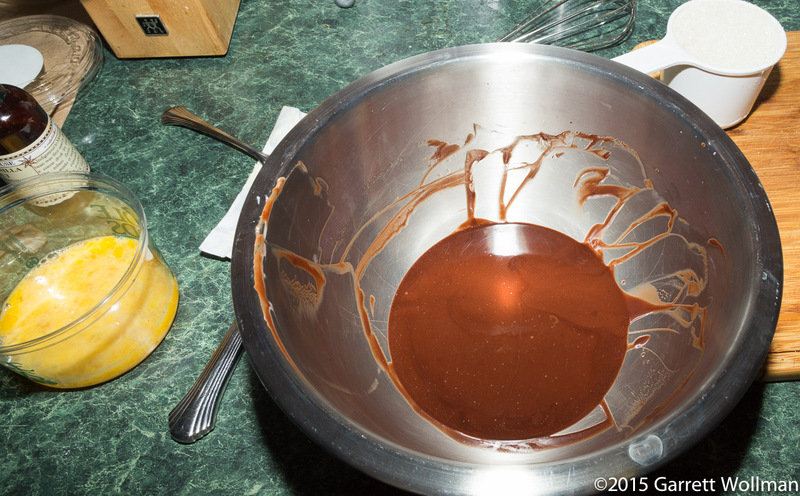 The first step is to melt the butter and the chocolate together in a double boiler. After this, the batter comes together quite quickly, adding first sugar, then eggs, flour, and nuts. 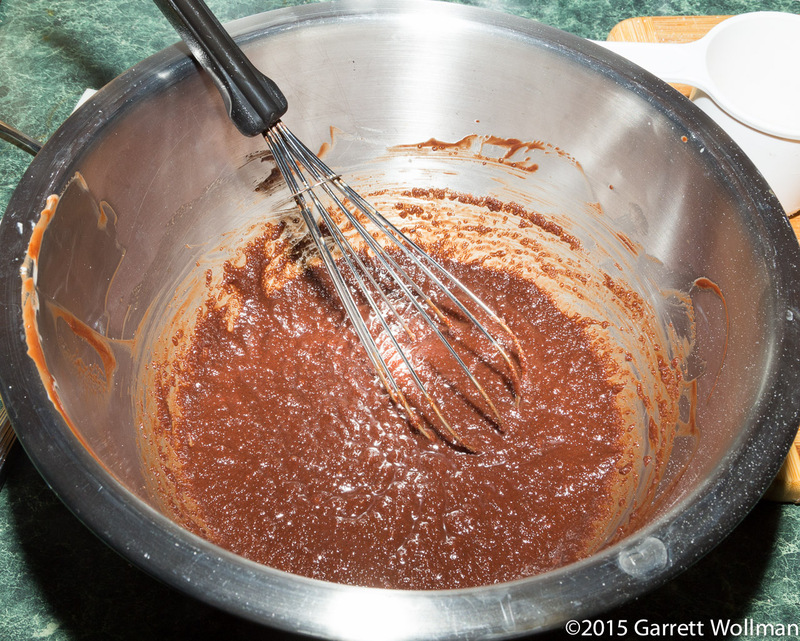 After adding the sugar, it looks more like batter and less like sauce. After adding in the other ingredients (eggs, vanilla, flour, and salt) I folded in the walnuts, and the batter was ready to pan. The recipe calls for a floured-and-buttered 8×8 baking pan; I used baking spray, and probably not enough, which I came to very much regret. I should have covered the bottom with a square of parchment for reasons which will be clear shortly. 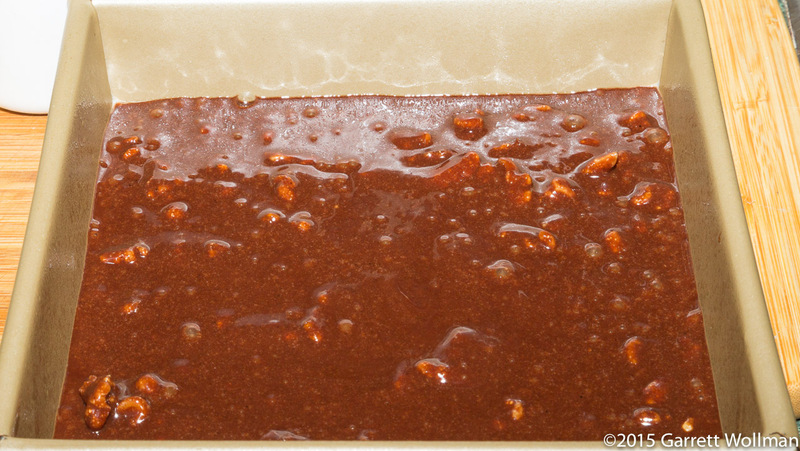 The brownies bake for about 40 minutes in a 325°F (160°C) oven, and then cool completely in the pan. 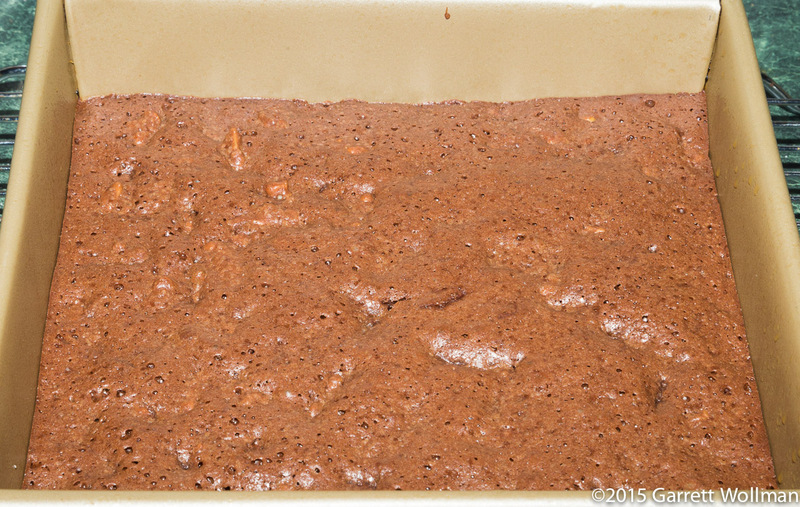 Longbotham actually recommends refrigerating the cooled brownies before cutting them, which I also did, overnight. Unfortunately, after cooling in the pan and chilling in the refrigerator, the brownies were nearly impossible to remove cleanly from the pan. In fact, as you can see here, I actually damaged the nonstick coating on this pan, which is quite an irritation — but also a lesson: never forget to line the pan, even if the recipe doesn’t say to do so, and make sure that there’s a surplus of baking spray on it if for some reason you can’t. And finally, there’s a single brownie waiting to be eaten. So how did they taste? 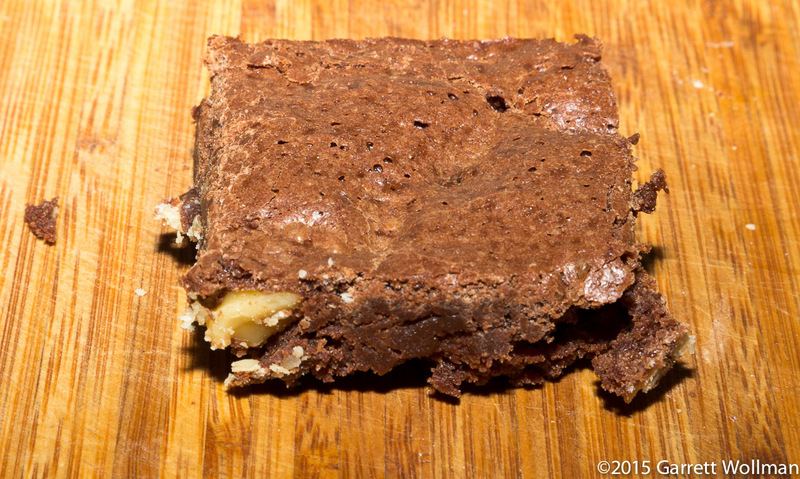 Pretty mediocre, if you ask me, and nowhere near as good as any of the other brownie recipes I’ve done. They are too sweet, the chocolate flavor is weak (unsurprising for a recipe that contains only 2 oz of chocolate, even if it’s good chocolate), and the texture is nothing to write home about either. 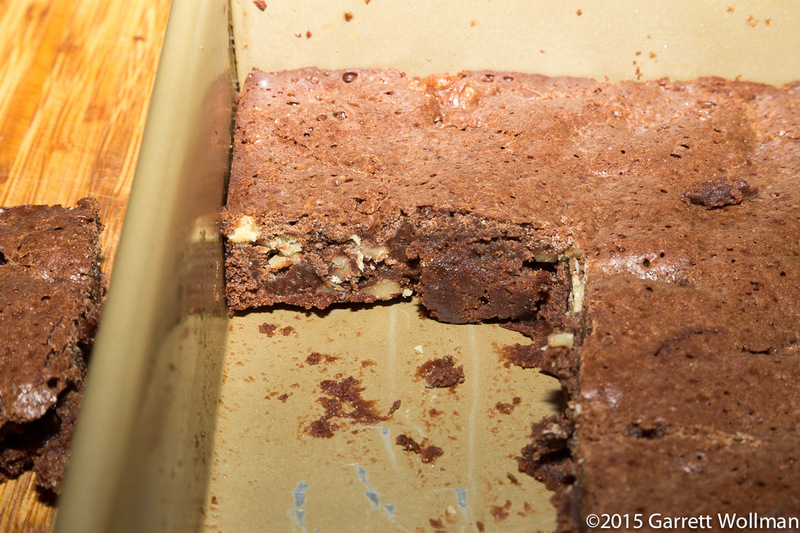 The one thing these brownies do have going for them is the walnuts. If I had the time to work on this recipe, I’d look at reducing the sugar and increasing the chocolate flavor, probably by adding cocoa powder (which does not contain fat) rather than more chocolate. I do plan to try other recipes from this book, however, so I will have a good idea whether the weakness of flavor is specific to this (rather dated) recipe or a general feature of the cookbook itself. I would note that this cookbook is old enough that it predates the time when publishers learned that baking cookbooks are supposed to have ingredient weights. 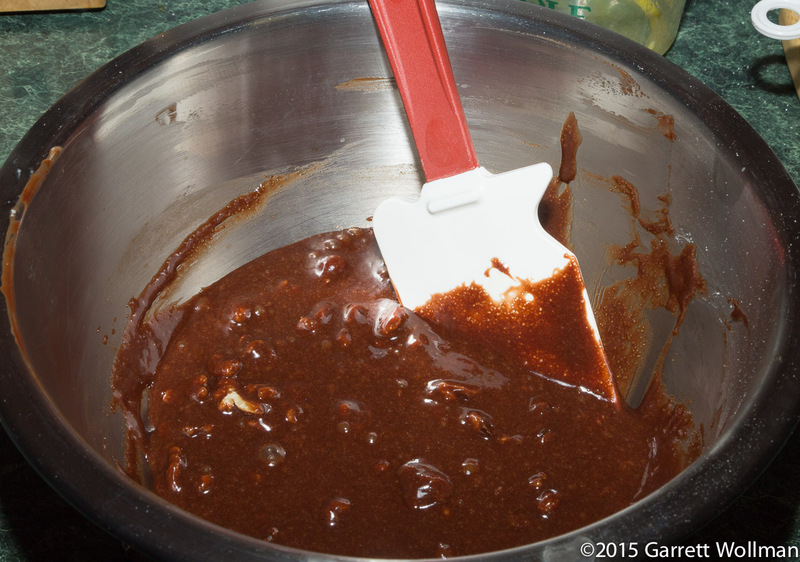 Gallery | This entry was posted in Food and tagged brownies, Lori Longbotham, recipe. Bookmark the permalink.